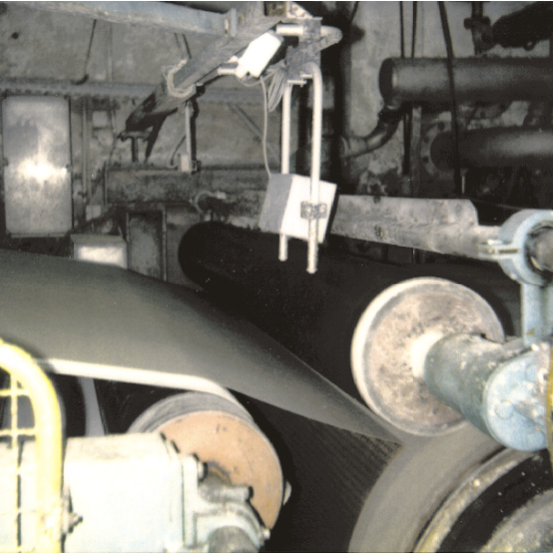 In paper production the prepared paper pulp flows onto a conveyor belt of fine wire mesh at the so called "wet end". There most of the water is removed by means of a vacuum. The paper web is generated and is transported to the second station, the wet press rollers, which determine the paper web speed by means of a second drive unit. In order to avoid tears in the paper web a laser position measuring system is used here which measures the position of the paper web between the two stations. The analog output signal of the sensor is fed into a closed-loop control circuit which influences the motor speed at station 1 and thereby ensures that a specified setpoint distance value is maintained.